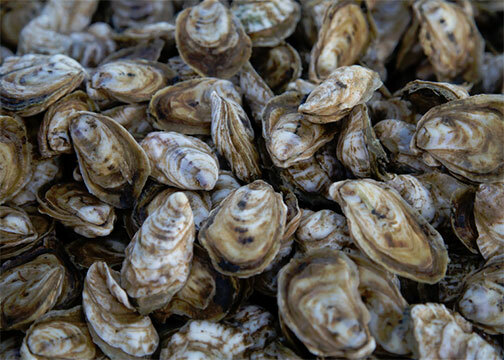 Environmental and agricultural economists at Mississippi State are hoping to change the equation of oysters harvested from state waters through the development of a new decision support tool. Daniel Petrolia, an associate professor of environmental economics in the Mississippi Agricultural and Forestry Experiment Station recently was awarded nearly $600,000 by the National Oceanic and Atmospheric Administration and will lead a team to develop a shellfish portfolio assessment tool called SPAT. The tool will assist resource managers and oyster farmers to determine the best oyster cultivation practice that will minimize risk while maximizing benefits. Petrolia said the state of Mississippi established an ambitious goal to produce one million sacks of oysters per year. One sack is equivalent to 1.5 bushels. "The state is working to increase the ecological and economic benefits to the state from healthy and productive natural oyster reefs and farms," Petrolia said. The study, which will determine the benefits derived from three different oyster cultivation practices—restored oyster reefs, traditional shell plantings, and off-bottom oyster farms—is timely, considering Mississippi's slip in oyster production. In 2004, nearly a half million sacks of oysters were harvested compared to 2014 when just over 78,000 sacks were harvested, according to the Mississippi Department of Marine Resources. The economic impact of the delicacy has also slid from $23.72 million in 2009 to $13.47 million in 2011. "The state's oyster industry began to decline with Hurricane Katrina and then again after the Deepwater Horizon oil spill," Petrolia said. "The decision tool will help those in the oyster farming industry develop the best strategy for increasing production." To determine the best cultivation practice, scientists will first assign monetary values to both market and non-market benefits of the different growing scenarios. These values will assist in the establishment of budgets that will include construction and maintenance costs for restored reefs, plantings and farms. Ardian Harri, an associate professor of agricultural economics in the Mississippi Agricultural and Forestry Experiment Station and co-investigator on the project, said increased oyster harvesting in the state impacts more than just the bottom line. "Oysters not only provide economic value but also a host of environmental benefits that include serving as water filters and stabilizing the coastline," Harri said. "Decisions about the best management practices for production must take into account both economic and environmental benefits." The project was designed to include a large knowledge base comprised of economists, ecologists, resource managers and marine extension specialists. "When complete, the decision support tool will direct users through multiple criteria to select the best portfolio of oyster cultivation in their area," Harri said. "With this tool, individuals will be able to make the best decision for oyster production on their property." William Walton, associate professor in the School of Fisheries, Aquaculture and Aquatic Sciences at Auburn University; Just Cebrian, senior marine scientist with the Dauphin Island Sea Lab; Jason Rider, oyster extension agent with the Mississippi Department of Marine Resources; and George Ramseur, office director for Coastal Restoration and Resilience with the Mississippi DMR, also are collaborating on the project. For more information, visit the Mississippi Agricultural and Forestry Experiment Station online at mafes.msstate.edu.